Manage your backlinks like a pro with Inspyder Backlink Monitor; the world's only multi-tier backlink management software. It's easy to use! Just enter your Root URL and add your backlinks as one big list. Backlink Monitor will automatically figure out the tiers, so you can finally say goodbye to complicated spreadsheets. Backlink Monitor automatically checks if your backlinks are active, indexed in Google and the Google PageRank (both domain and page specific PageRank values). Backlink Monitor's multi-tier support allows you easily identify broken tiers, so you can save time and money by focusing your link building efforts where it actually matters. The unique hierarchy view allows you to view your tiers so you can actually see what your links structure looks like. The powerful "Selection Tool" and "Visualizer" tool windows allow you to make deep, accurate selections of backlinks that are impossible in other tools. 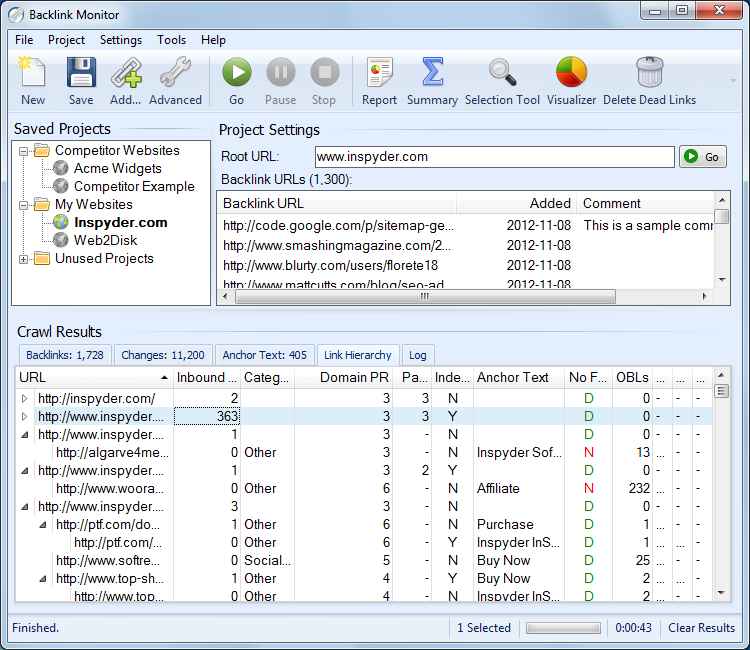 Backlink Monitor brings unparalleled power and ease of use together in an amazing application. Backlink Monitor integrates with many popular link indexing services, so it's easy to track and submit unindexed backlinks for indexing. Download your free trial copy today and see it in action for yourself. You'll join the thousands of professional SEOs who have already discovered the power of this unique tool.